I spend the majority of my day on my feet so by the end of the day they ache, my calves ache and I'm prone to muscle knots around my shoulder blades. 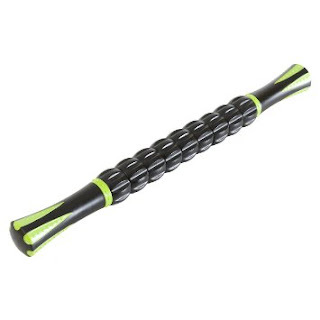 This Muscle Roller Stick is amazing!! It has an 18" stainless steel core, to give extra strength when needed, patented redesigned ergonomic handles, and non squeak individual rollers to penetrate deep in those hard to reach areas. The Muscle Roller Stick releases tension in feet, calves, back, and arms with a deep tissue massage. I love mine, it's become my dear friend. It's built for travel, fits easily into a gym/travel bag, you never know when a quick massage is in order. All Asana Fitness Products are backed by a 100% money back guarantee.